I will be following up this infographic with a helpful chart on koi length, age and size so help you better understand how your fish grow. I have been interested in fish for over 25 years. I have two degrees in marine science with a specialization in fish ecology and physiology (as well as a chemistry minor). 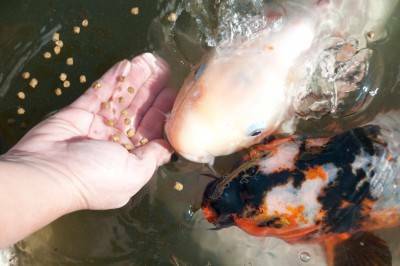 Like many kids, I had a goldfish growing up but decades later took care of several koi ponds. Koi are such great pets and very accessible for many folks wanting to get into owning koi in a pond environment. Why ar my white koi (10-12 inch) turning pink? Nitrites-Neg, ammonia -Neg, salt content-0.29 for one week then will do a 20% water change for fall. 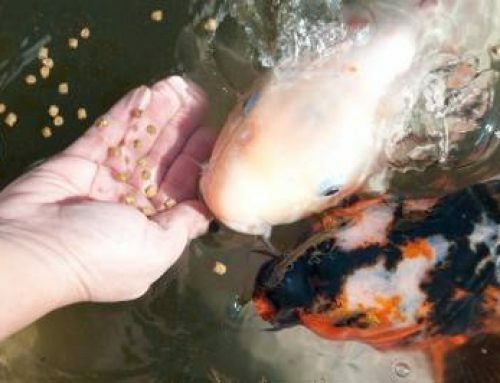 It has a lot to do with the food you are feeding your koi. Flamingoes are pink because they eat shrimp etc. There are special foods out there for koi that help with color. I have a black and white koi that I got from a friend a month ago. I think it’s about 1.5 years old, 20-22″ long. Ever since we got it…I noticed that it started to turn pink…almost peachy where it used to be white. I am feeding it the same food that previous owner used to fed it. The fish seems fine, doesn’t seem to eat as much as the other fish though. Is something wrong with this fish? There’s a few factors at play when it comes to koi coloration. What about color enhancing food? yes, there’s products like Saki-Hikari and Dainichi but they aren’t cheap. They are typically used by those that are involved in competitions. I was advised not to feed for the next 5 days and then gradually in small amounts. The fish were previously doing well with 2 feeds a day but I was vacuuming and changing about 1/6 of the water due to algae problems. help populate your filter media with beneficial bacteria. I’m very new to caring for Koi. When cleaning the round sponges in the filter I was using the hose. I later was told I should have used the pond water and the reasoning behind that. I honestly didn’t understand the purpose of the filtration system as far as the good bacteria, etc;. Now, one of my largest Koi (about 9″ long) had died and I’m very bummed out about it. It looks like it has an ulcer on both sides of it and the tail fin looks like it might have had a little rot. What should I do to protect the other Koi? I added an anti-bacterial solution I got at the local pet store and was told to continue for seven days. Is there anything else I should be doing as an added measure? a healthy koi won’t typically develop ulcers or fin rot in ideal conditions which means that its immune system was depressed or there was poor water quality conditions. If your fish was still alive you would want to isolate that fish in a separate pen and treat with a topical antibacterial but ultimately the source of the problem would be water quality so that is the first thing you need to address. Being springtime its a good idea to give your filter media containing the beneficial bacteria a boost with something like Microbe-Lift PL. You could also do water changes as well. Test your ammonia and nitrite levels. For a primer on how some of this works i have an article and infographic here (http://koi-care.com/understanding-biological-cycle-koi-pond/). We just moved into a new house w/ a 8”x3’x9″ pond w/ pump waterfall. It has some string algae, water bugs, snails, etc. Can I just put small koi in and let them eat what’s in the pond w/o feeding? its possible but you may have to supplement with floating pellets as well. Good morning, your site is very informative, my pond is clear I do have a UV light but my problem is on the stones or the waterfall i have green algae and would like to see the stones clean. How can I clean them without hurting my koi. A lot of pond owners have good luck with string algae control by using Green Clean (http://store.koi-care.com/product/green-clean-algae-control/). It works on contact. In fact, the manufacturer put out a little video showing it in action (https://www.youtube.com/watch?v=OZeLL-wEZyY). Completely safe for your koi. Let me know if you have any additional questions about it. Six Koi disappeared completely, there are three left in pond. I totally cleaned the pond but the Koi are sticking their heads out of the water. Someone told me to put salt in the water because something is missing. I am very sad and frustrated. If you have koi disappearing it must be predation. If they jumped out you would see evidence of it I would think. You can certainly add salt to the water- it will give them some osmotic relief. You may want to have your water chemistry tested. my small fish survived the first winter after I followed you information. I live in virginia now its almost spring time and air temp are hitting the 50’s. Q1. I dont have a water temp, but is there a simple match to find water temp from air temp? Q3: I also need to give them spring food. Less Protein, Wheat Germ. I could not find any Wheat Germ Flake Food…I could Only Find wheat Germ Pellets. Any thoughts or suggestions? Q4: Pond Cleaning: I have debris, like leaves etc at the bottom of the pond. Can I take out all the water, clean the pond and refill with new water this spring? or should I wait for warmer temperatures (70 degrees). Also, while cleaning the pond, should I clean by bio filter or leave the filter as is to keep the bacteria intact? Please suggest. thanks so much Grant…you the best. Hi Nick, glad you could use the info. I provide on my site. I will be redesigning the site over the next two weeks as I am a little out of date and not mobile friendly. q1. I’m sure there is a formula to use for pond temps as they relate to air temps however there would certainly be some complicating factors to consider such as shading of the pond and depth. I can tell you that I have bought thermometers at places like Home Depot in the past and I subsequently did a week long comparison test with a scientific grade thermometer to check its accuracy -turns out they are accurate and not too expensive. Q4. I would actually wait till the water gets a bit warmer. Spring is kind of a strange time for koi in that they are more susceptible to things like parasites and bacterial invasions. Their metabolisms and immune systems aren’t in full swing but the nasties that invade ponds are. Keep the bacteria on the filter but if its really gummed up just do a light cleaning on it. Just watch your pH when you empty then refill the pond -you don’t want the pH in the newly refilled pond to be too far off from what they came out of.